JustMensRings.com knows how hard you worked to find and woo your soon-to-be-spouse. We have aided thousands of happy couples in finding affordable rings without any compromise on quality or style, and our men’s Benchmark titanium wedding ring with a hammered finish is no exception. Titanium is quickly becoming one of the most beloved alternatives to precious metals such as platinum or palladium. Titanium delivers one of the highest strength-to-weight ratios of any transition metal, but it will also resist corrosion, denting, discoloration, and scratching for a lifetime. Our 7mm men’s Benchmark titanium wedding ring with a hammered finish is a timeless choice for any contemporary man, and you can even add an engraving to cherish for years to come. A hammered ring is truly unique and offers an exquisite solution for any man who strays away from shiny jewelry. The 7mm men’s Benchmark titanium wedding ring with a hammered finish is ruggedly masculine and striking from every angle. We designed this ring in the comfort-fit style by using extra metal to create a domed interior. Comfort-fit rings such as these are comfortable to wear regardless of what you do for exercise, recreation, or work. Comfort-fit rings also tend to run a half size smaller than their traditional counterparts. We recommend that you have your ring finger sized for accuracy to ensure that a comfort-fit ring exceeds all expectations. 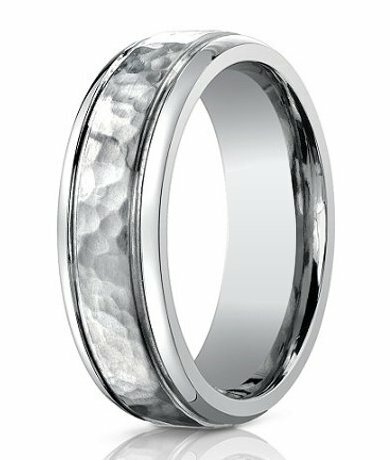 If you have any questions or concerns about the men’s Benchmark titanium wedding ring with a hammered finish, please contact us today to learn more. My husband loves his wedding ring!!! Very comfortable and stylish. We are very happy with the ring. We had to exchange it because the sizes ruin a 1/2 size bigger than the jewelery store. The exchange process was simple and quick. So glad that we found this website! Perfect ring for a man who works with his hands! I picked out this ring for my husband because it was unique looking. He loved the fact it was comfortable and also the hammered center hides any scratches or scuffs that he might get while working. Customer Service was quick to follow up on delivery, warranty registration and to make sure we were happy. We love it!